Seven people suffered minor injuries this morning when an out-of-service MBTA trolley rolled backwards and collided with an inbound Ashmont trolley along a stretch of the Mattapan High Speed line inside Cedar Grove Cemetery just after 7 a.m. The incident drew a large response from Boston Fire and EMTs, who transported two trolley operators and five passengers to local hospitals. Passenger Bindiya Singh, 15, was on trolley 3087 traveling inbound towards Ashmont when she said she heard the driver yelling. She looked up and saw a light coming towards the car. Then she hit her head as the two cars collided. "It hit us pretty hard," said Singh, who held an ice pack to her head. 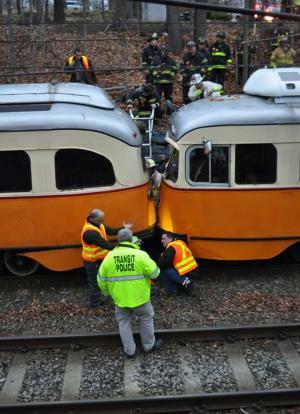 MBTA spokesman Joe Pesaturo said that the cause of the accident "is unclear at this time," but he confirmed that an out-of-service trolley —carrying no passengers— "rolled toward another trolley and made contact with it." "Investigators will be interviewing the trolley operator and inspecting equipment as they gather all the facts in this matter," said Pesaturo. The accident scene was a challenge for first responders, who cut through fences and used ladders to get to the two presidential conference cars, which were situated close to a bridge inside the historic cemetery. "We had a little trouble finding it," said Boston Fire Deputy Chief Mark Shea, who said that "it was a little involved as far as trying to get access to the location." Trolleys collide: Workers inspect the damage. Photo by Bill ForryDeputy Chief Shea said there were ten people on the two trolleys at the time of the accident. Several passengers were carried from the scene and up the embankment on backboards before being loaded into waiting ambulances. Trolley service was suspended in the aftermath of the accident, with shuttle buses used to transport passengers along the trolley route. Service resumed at 8:53 a.m., according to Pesaturo.